Toronto Maple Leafs Notebook: Why hasn't the full lineup found its groove? First, we start off with some… basketball. Two summers ago in the NBA, the Boston Celtics made waves with a blockbuster summer, trading for star Kyrie Irving and signing the marquee free agent on the market, Gordon Hayward. Unfortunately, a gruesome season-ending injury to Hayward meant fans never got to see their team with all of its talent rolling. As the season progressed, there was more bad news in store as Irving’s season also ended prematurely. And yet the Celtics had a collection of young players and role players elevate their games, powering the team all the way to a Game 7 in the Eastern Conference Finals against LeBron James and the Cleveland Cavaliers. Entering the new season, expectations were sky high for the Celtics with a fully healthy lineup and LeBron now out West. Yet the team has struggled, relatively speaking, to live up to their potential to this point — their record sits at 25-18, good for fifth in the Conference. The popular pick to win the East, the Celtics would not even have home court advantage in the first round if the season ended today. And that’s where we start with the Leafs. A young, promising team oozing with talent signed a hometown superstar in his prime this summer. The expectations understandably shot through the sky. The team was unable to sign one of its top players in William Nylander to start the season, so Leafs fans had to wait to see the full complement in action. Auston Matthews was then injured during the season, with perhaps their most cohesive stretch of hockey following in his absence. Eventually, Matthews returned, Nylander signed, and fans licked their chops at the prospect of finally witnessing the Leafs‘ lineup fully assembled. Since then, the team is 8-7-2, 18th in total points (though they do have a game or two in hand). Their power play has clicked at 13% (24th) and their penalty kill at 82.6% (15th) in that time. Granted, they have also been missing Frederik Andersen for a good stretch of time recently and are still +4 in goal differential over that span. Individually, four players are a point per game or better in that time, led by Mitch Marner followed by John Tavares, Matthews, and Morgan Rielly. But at the bottom of the list, we see top-nine forwards like William Nylander with three points in 17 games, Patrick Marleau with four points, and Nazem Kadri with one goal (and nine assists, to be fair). All of that said, the stats don’t really tell the whole story here. The Leafs have just lacked any sort of cohesion or purpose to their lines. This is a team that is built on forward depth and its offensive attack, and really they have yet to put together a game where all of their lines are really rolling and producing. Babcock, to his credit, has consistently tinkered with his lines and shifted players around, even during games for the first time in his Leafs tenure. Nothing has stuck as of yet. He is still very much searching for a formula that works for the highly-talented forward group at his disposal. What is really striking is the lack of engagement within the overall group. The screenshot below is captured moments before what was eventually the game-winning goal for Colorado last night. All five players are watching the puck. Dermott doesn’t even come close to reading the situation properly as he engages below the goal line. Matthews stood in no man’s land, confused as to where to go (a theme last year in the playoffs against Boston). It leads to a goal in the slot, where Nylander was a good second away from closing down properly. 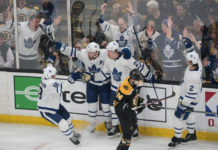 The game before, a big Saturday night home game against what constitutes their biggest rival at this point, on the first shift of the night, the Leafs got dominated and Brad Marchand mercifully missed a wide-open net. I thought they worked harder than we did. Any way you look at it, I think we are .500 in our last ten. Since Christmas, we haven’t been engaged enough. We haven’t competed at a high enough level. If you just did a, ‘Who won all the races and who won all the battles?’ They did. That’s the reality right now. The Leafs are searching for answers and trying to get into some sort of groove. They clearly have a majority of the pieces required to win a championship; it’s a top-five roster in the league. For whatever reason, though, they are not in sync right now. While they have been trending up in their possession numbers, some of it is circumstantial as teams have happily sat on leads against the Leafs – Nashville, Tampa, Boston – and they still suffer complete lapses in the defensive zone (any number of highlights can be placed here). Some of this will naturally sort itself out: Nylander can’t possibly be this bad the next 17 games. Andersen is back now. The power play is too good to continue to be this bad. They are still going to make the playoffs, and their end-of-season stats will all look pretty good. But if they are watching themselves right now and being honest, they have lacked any sort of flow to their game, and as a collective, the players look disengaged. It’s that middle-of-the-season-grind time of year and it’s far too early to truly worry. That said, it’s definitely time for a sense of urgency to kick in. Let’s get right to Jake Gardiner: It was an awful play. He was first back and as a veteran NHL defenseman that is closer to 30 years old than 20, in no world should he be muscled off of the puck and finding himself on the outside while a player cuts in for a great scoring opportunity. It was a bad play that he was appropriately benched for the rest of the period for, and obviously, he knows he messed up. Booing him was uncalled for, though, and personally, I felt bad for him to have to endure that from what should be his own fans. On the first shift he was booed — which I’m sure caught him off-guard — he made a beautiful stretch pass down the ice. Good for him on that. Tidy piece of business for the Leafs to get Trevor Moore signed for under $800K for each of the next two seasons. This will be the Leafs’ reality in the cap world – sign cheap, useful players to plug holes around their cast of highly-paid stars. With Moore signed, that gives the Leafs eight forwards under contract for next season with four RFAs upcoming (Matthews, Marner, Johnsson, Kapanen). Unless there’s a shakeup at forward, it’s difficult to see the team signing their pending UFA back at this point. Even with the emergency call-up, from my understanding, Michael Hutchinson is at nine games played for the season. Had Andersen not returned and he played his 10th game, he would have required waivers in order to be sent back down to the AHL. That would have left the Leafs with an interesting little dilemma considering they just traded a fifth-round pick to acquire him while also appearing to believe quite a bit in Garret Sparks. Hutchinson had a reliable showing with a .914 save percentage across his five games while showing a calm, controlled demeanor. He’s a goalie who just likes to make himself big and challenge shooters, with an unspectacular style of play. That said, he definitely wants that Pastrnak goal back. Bad giveaway and all, it went right through him. It was nice to see Mitch Marner shoot one in on the power play against Boston. The overall PP struggles are noted above; it was said in this space for a month that while the PP was actually rolling, teams are going to sit on the pass and figure it out. They have and the Leafs still need to adjust. Some of this is lip service, but he is also right to give the Leafs defense some of the credit they don’t often get. The Leafs forwards are generally poor defensively and it doesn’t make their lives any easier. The team is eighth in goals against per game. Andersen plays a significant part in that, but they deserve some credit, too. At some point, the forwards have to be held accountable as well. He’s right that there is a good pipeline in place. That said, the Cup window is already open, so how the Leafs will walk this line will be interesting. I’m not sure they should be waiting 3-5 years for their young defensemen to fully develop. It seems like the Leafs are pretty well destined to draw Boston again. I’ll reserve judgement until I see what their rosters look like at the end of the season. I think I’d just blow-up the lines because this group looks like it needs a shake-up. Put Kadri back with Marner and Marleau, Matthews with Hyman and Kapanen, and see if Tavares can get Nylander going (with Johnsson on the other side). If the struggles continue, at some point, I think you need to consider pushing Patrick Marleau way down the line-up. That’s too many games in a row now where he is not making any impact whatsoever, while Connor Brown actually acquitted himself quite well alongside Tavares and Marner. I think I’d give it a run of games with Nazem Kadri receiving the tough matchups. He is just not engaged at all right now; I barely notice him in the run of play, and I’m not sure he’s knocked a single guy down yet in 2019 (that is a big part of his game). He gets fired up for that responsibility. Give it to him and challenge him. I think I understood the Leafs switching the defense pairings in the third period against Colorado, but I’d probably just revert them back. I don’t think Travis Dermott is consistent enough with the puck yet to make up for Nikita Zaitsev’s overall inability to advance it successfully, and while I know Jake Gardiner has a pretty bad reputation at the moment, this is still a guy that has a chance for 50 points while playing on the second PP unit all year with Zaitsev by his side at 5v5. He can move the puck. I think I’d be looking to create two power-play units — not because I don’t think the first unit can turn it around, but because you can’t have just the one unit in the playoffs. They need to spread it out a bit; once the second unit steps on, it’s pretty much a complete waste of time. The way playoffs work with matchups and the overall grind, you can’t have only one unit. Start planning ahead now.